(Starts recital. Visitor panics and picks the first one they recognize). Now I can hand over a list. 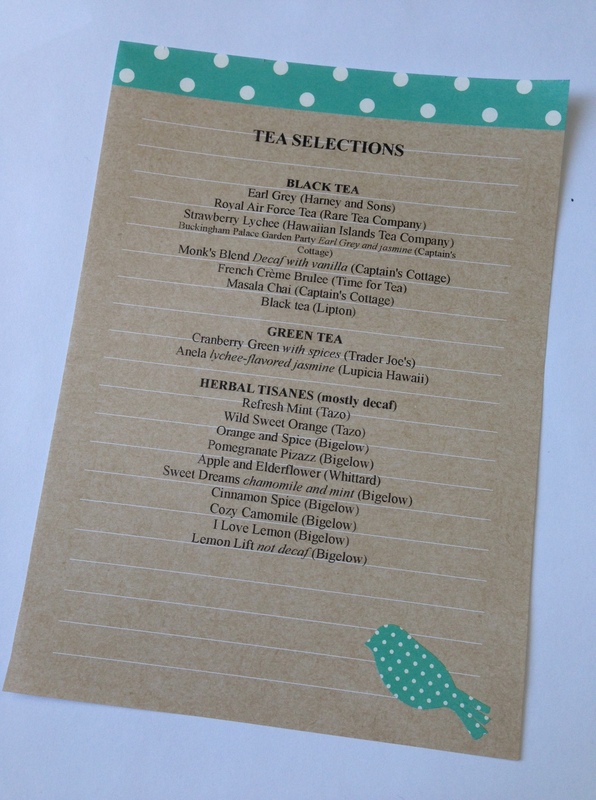 The list is printed on 5×7 paper from a notepad I bought at Michael’s. Posted in Uncategorized and tagged Tea. Bookmark the permalink. 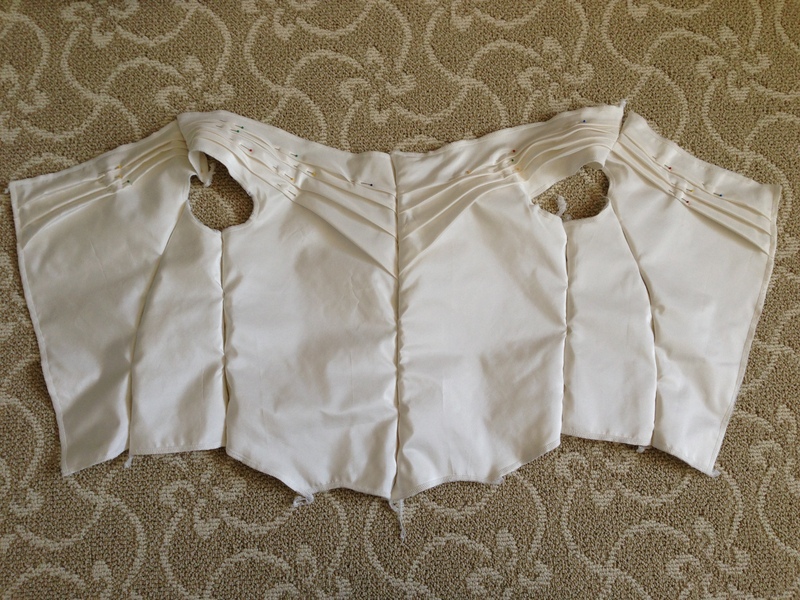 For my 1830s dress I made a pair of sleeve supports, aka sleeve poufs/poofs/puffs. The TV455 pattern does not include a pattern for sleeve poufs, so I had to make up my own. If someone has some good instructions for an easier or more historically correct method I’d be very interested in it! The TV455 pattern for the Romantic dress suggests using 2 layers of netting for the beret (evening) sleeve. For the gigot (day) sleeves the pattern suggests you make a “sleeve crinoline” using the beret sleeve pattern, using lining and netting fabric gathered to armbands. 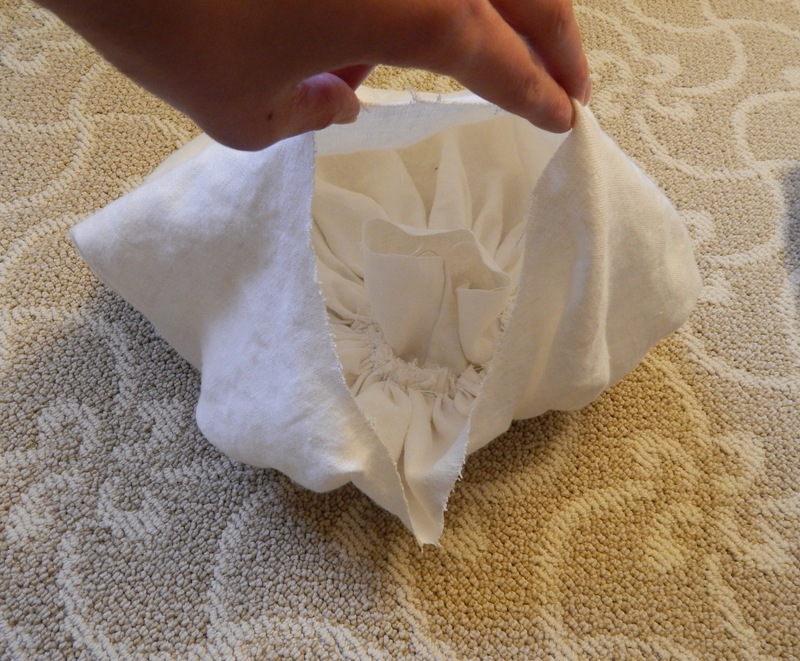 There are no instructions on making a stuffed pouf, but I wanted a little more support in case the sleeves got crushed. This is an antique pair from the Victoria and Albert Museum, from about 1830. The TV455 pattern has a very large, mostly circular shape for the sleeve. 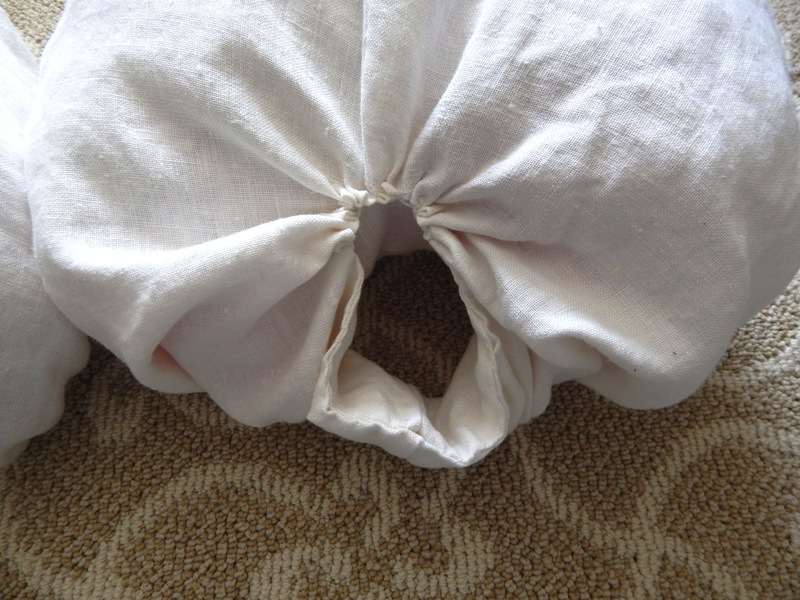 The outside circumference is meant to be gathered into the shoulder seam, and the inner circle is gathered onto an armband. 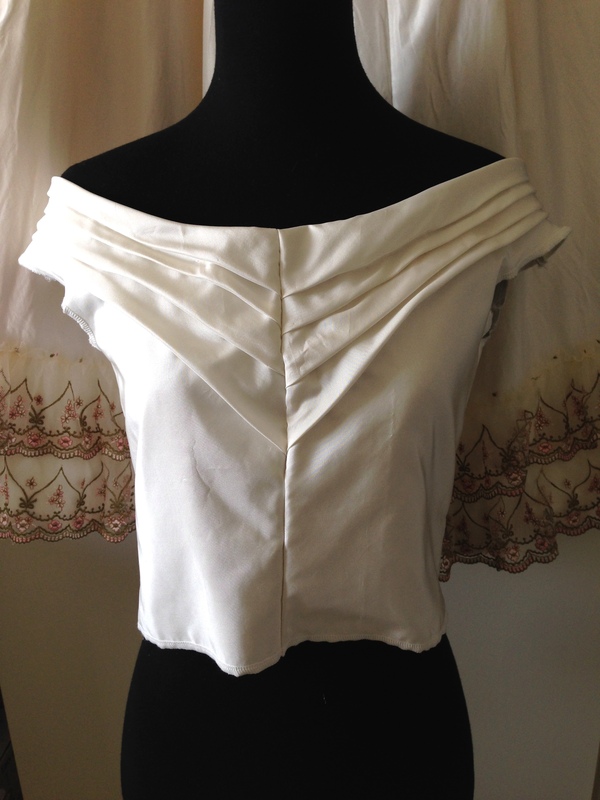 I cut two of these out of a thick linen. 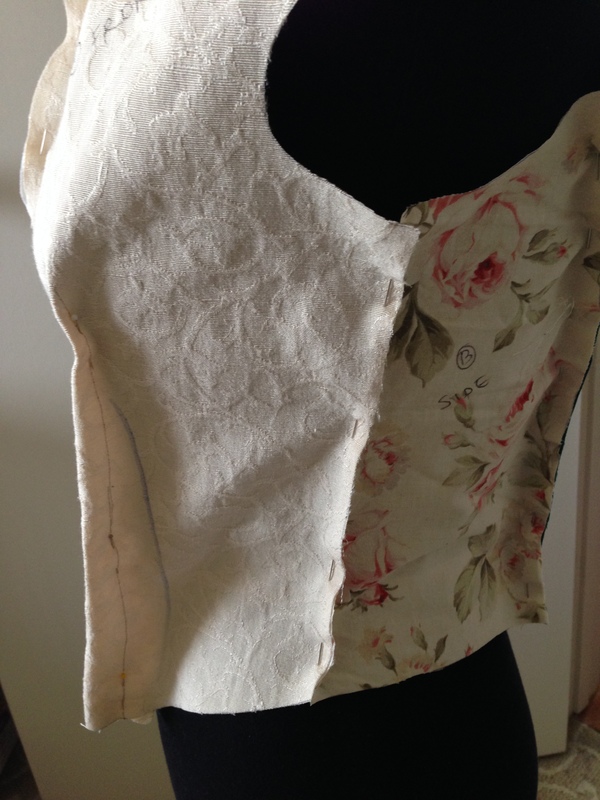 Instead of gathering the material into a bodice, I gathered it into a tube of fabric about 4 inches wide, and a little larger than the size of my upper bicep. 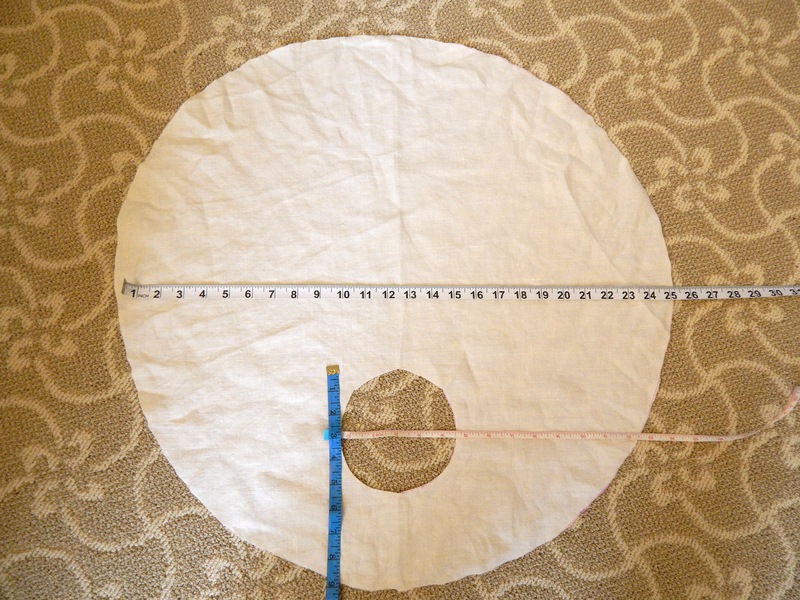 (On the left side you see the raw edges of the circular hole that was cut out of the big circle). 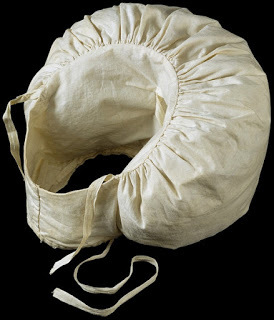 The tube then gets pushed into the middle of the pouf shell. Here is a view from the hole. 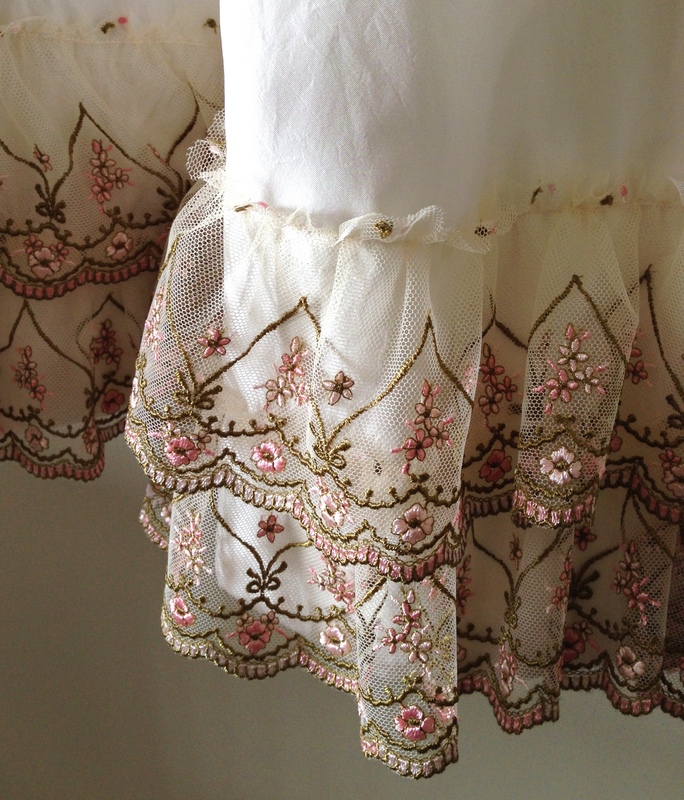 I then stuffed the inside with scraps of tulle and organza left from previous projects, including a 2005 Halloween costume and 2007 Victorian ballgown. (I think this means I hoard fabric too long, and it was nice to use up a lot of scraps for this project! 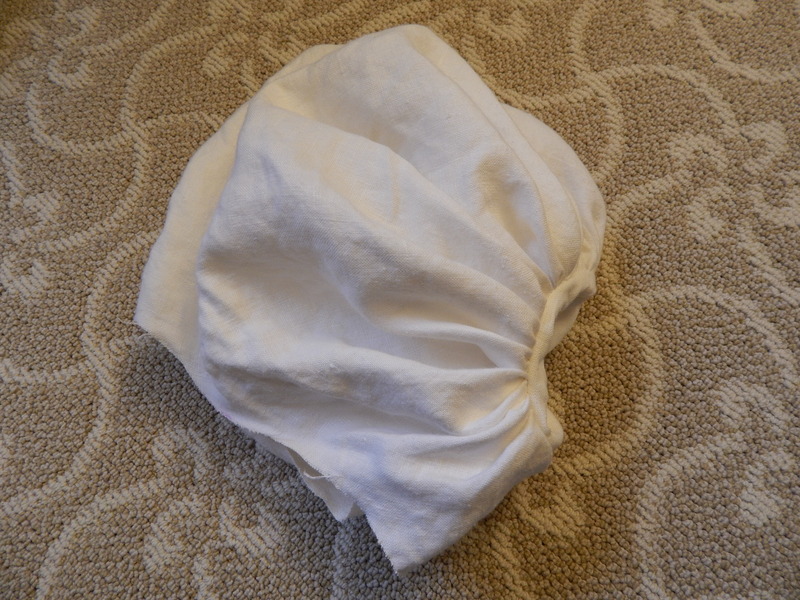 The linen was also pieced together from leftovers). 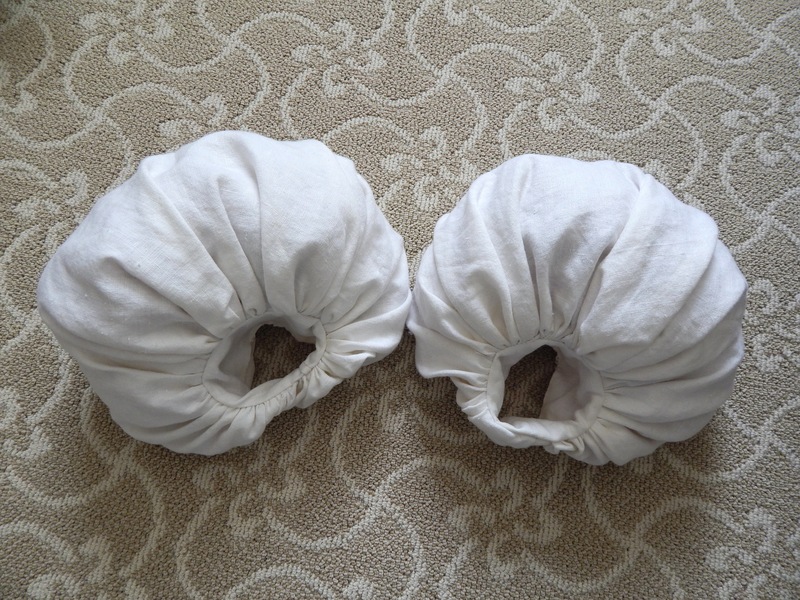 Using cotton batting or polyfill would make a plumper and more solid pouf, but I wanted to keep these very light. 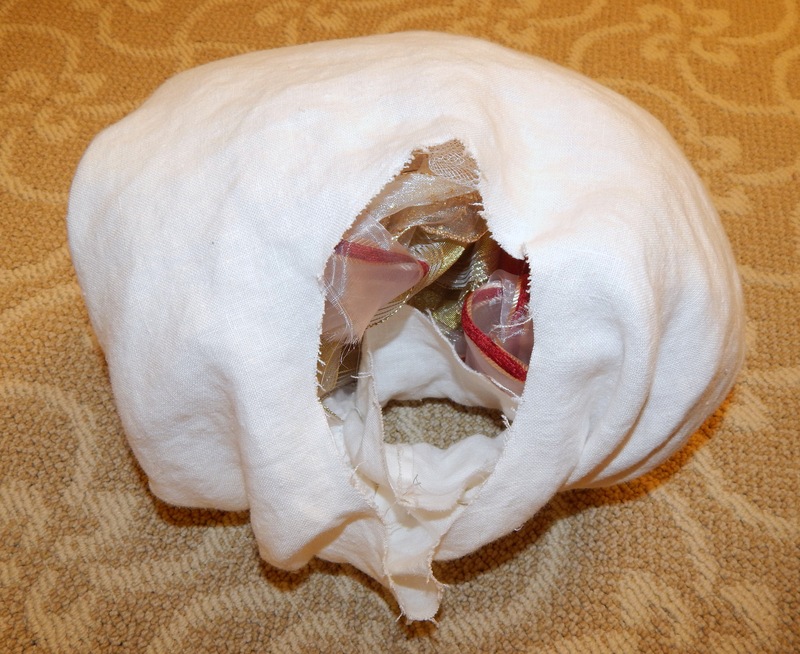 The stuffing was placed around the tube of fabric, and the bottom portion was left unstuffed. 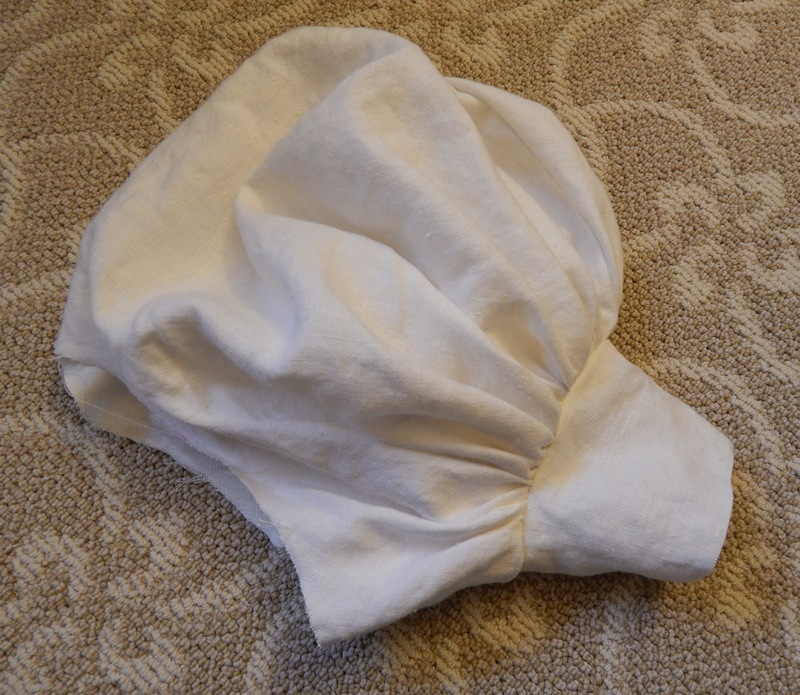 (Note: My linen was fairly opaque, but if you use a thinner fabric you will want to stick to light-colored stuffing). 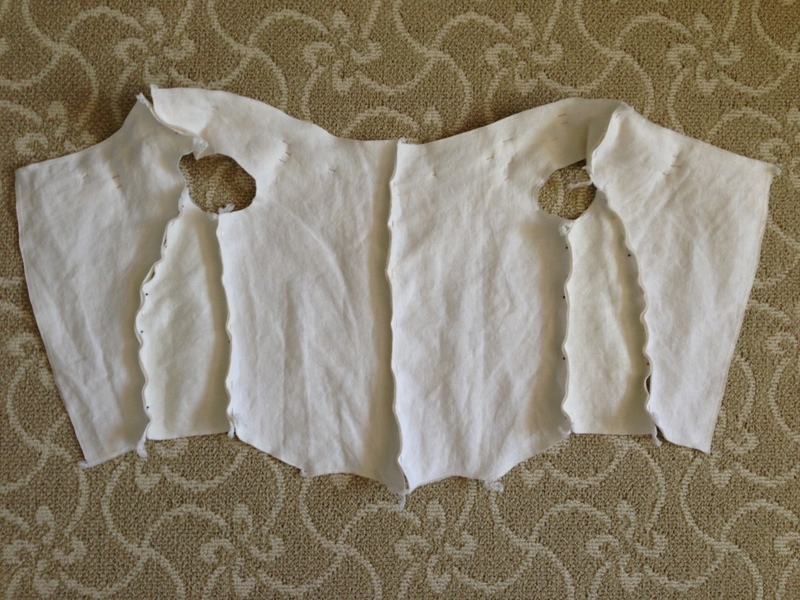 After stuffing, the edges were whipstitched closed, with the top portion gathered slightly. 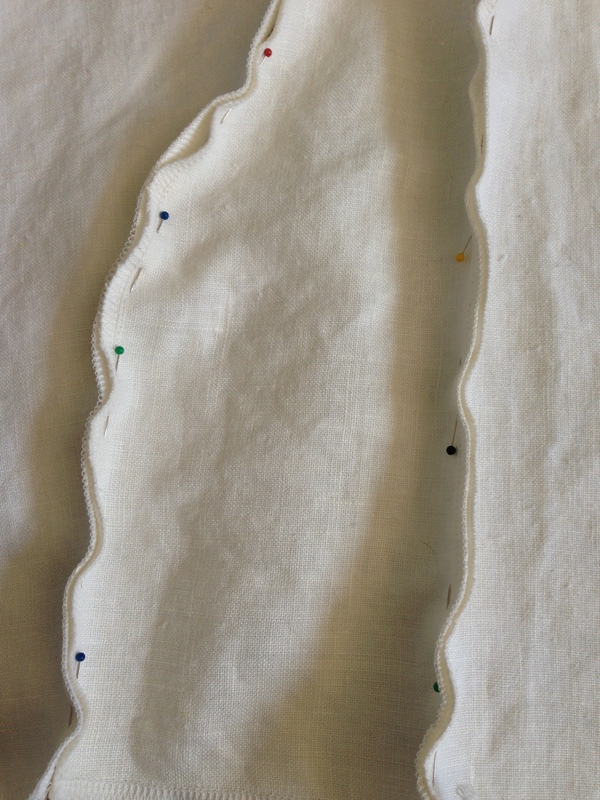 Here is the view from the other side, where the tube was first sewn on. 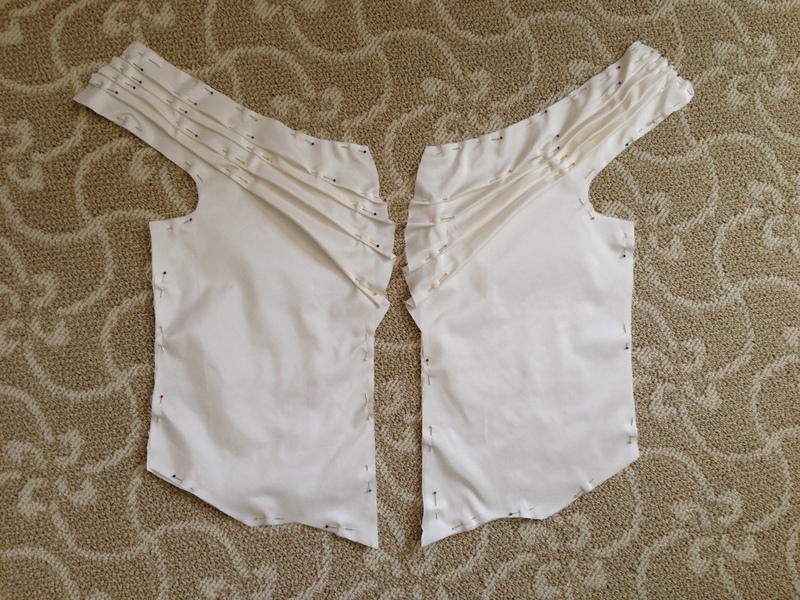 I still need to sew on some ties, but I am waiting to finish my bodice first. 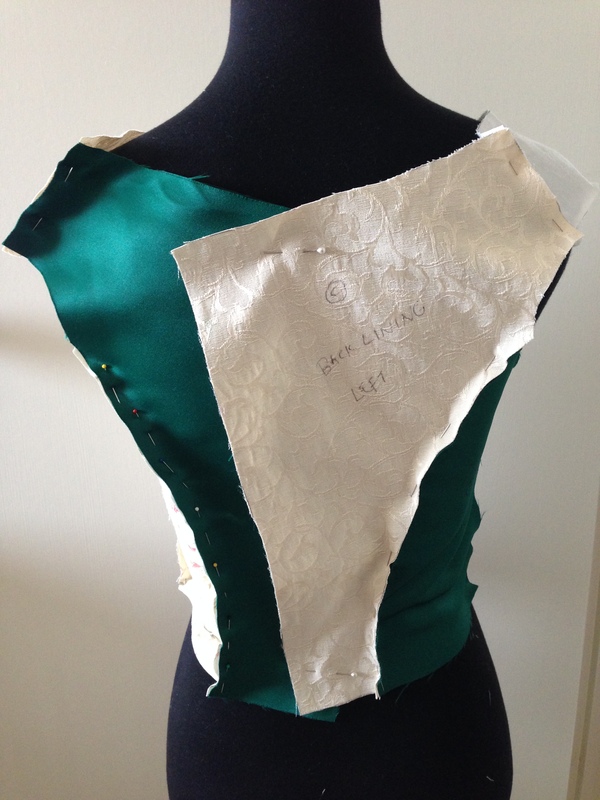 Then I can figure out if it will be more comfortable to attach the poufs to the corset or bodice. Since this is my first set of sleeve poufs, and I was unsure of the shape, I used the sleeve pattern I had. However, I am sure there’s a better way to make these using less fabric. If I were to make another set I would probably draft a shape resembling a bread loaf with side tabs as the outer shell, and a smaller oblong shape for the inside cuff. That would reduce the bulk at the bottom as well.